There are many reasons why an email is not delivered to the recipient. That should give you an idea why email delivery is so tricky and complicated, which is what created a niche for the email delivery industry, and which is why companies like Aweber, MailChimp and GetResponse even came into existence and have thrived while charging a hefty fee for what you would think is the simple act of delivering email over the interwebs. When you use DAP for sending out emails (whether autoresponder or broadcast emails), the “From Name” and “From Email” you set up in the DAP Config are used to send out the emails. If you use your own web host as the “carrier”, then your web host’s email server is the one that carries the email and tries to deliver to the inbox of the recipient. And web hosts are generally not very good at the intricate science of email delivery, which is why if you’re going to use DAP, we recommend that you bypass your web host and have a third-party email system like Amazon SES deliver your emails. Regardless of the carrier (web host, Amazon SES, AuthSMTP.com, etc), all bounced and undeliverable emails come back to the “From Email” that you have used under DAP Config. DAP by itself does not do anything with those emails, as those emails don’t come back to DAP, but they go straight to the inbox of whatever “From Email” you have specified. We will surely address this in the future. But for now, you will have to manually review those email bounces, see which one of them sound more serious (like, say, recipient email id not found, or domain no longer in use, etc), and then de-activate those email id’s from your DAP database. When you use Amazon SES, Amazon by itself also monitors email id’s that have a consistent history of bouncing back, and will automatically suppress those email id’s and won’t even deliver email to those email id’s even if DAP did send the actual email to those id’s. By default, the DAP Admin User does not have access to all of the products you create. This is a deliberate feature, because every time you protect content in DAP and try to visit it yourself while logged in as DAP admin and WP admin, we want you to see that the content is actually protected. So, in order to be able to “see” the locked content yourself, you need to give yourself – the DAP Admin user – access to all of the DAP Products you create. 1) When you log in to DAP admin dashboard, click on the “Welcome <admin name>” link towards the top left corner of the DAP dashboard screen. 2) That will take you to the User > Edit page, where you can see the email id of the DAP Admin user. Copy the email id. 3) Go to Users > Manage page, and search for the email id. 4) Give yourself access to all of the products, one by one. Q: How to automatically add a new user in DAP to a 1SiteAutomation.com (1SA) list (or other 1Shoppingcart – 1SC – private label)? A: Every list in 1SA/1SC gets a unique email id – like 1sc-12345@autocontactor.com ). And make sure you set the “Direct Subscribe” field in your 1SA/1SC list to be “On”. If you are using double-optin for your DAP product, then you would normally have entered the text %%ACTIVATION_LINK%% in your email body, which is replaced by a unique confirmation link specific to that user. Normally, when that activation link is clicked, the user is redirected to your login page configured under Setup > Config > Login URL. Where “http://link/to/landing/page/” is the URL where you want them to be redirected to after they click on the double-optin activation link. DAP has a security check to prevent password sharing. And starting DAP v4.4, you can turn this off at both a per-user level and also at a global site-wide leve. There, on their user profile, towards the bottom, set the field “Exclude from Login IP Check” to “Yes” and save. This user will now be excluded from login IP check. NOTE: If the user’s account is currently already locked, then you also need to unlock it this one time, but going forward, the account is now whitelisted, and will not get locked again. Set “IP Login Limit: Max. # of User Logins From Different IP’s” to a high number – like “100″. Set “Flush Login IP Records How Often? Every….. ?” to “Day” so that any accumulated IP records gets flushed every day. 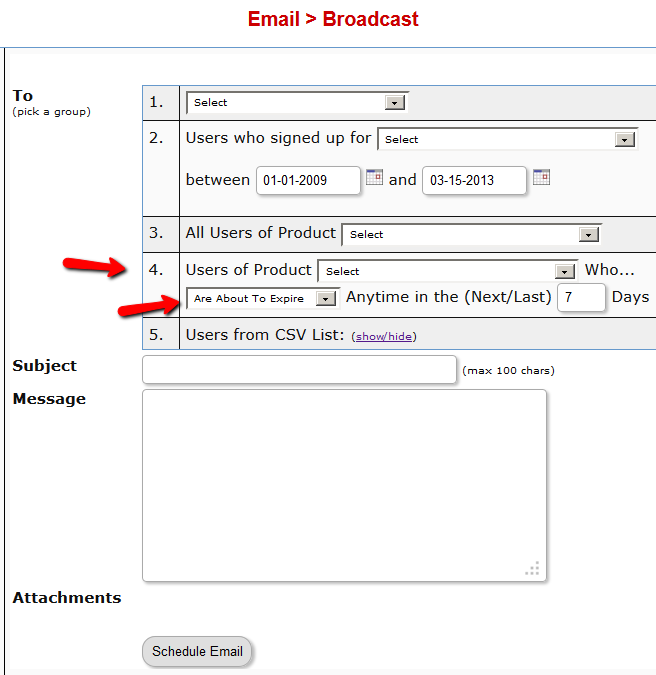 You can send an email broadcast to expired users of a product/level, on the DAP Admin > Email > Broadcasts page, by selecting Group #4. The same feature works for sending emails to those who have “Cancelled” their subscription or trial. Once you’ve scheduled the broadcast, the emails will be sent out at the top of the hour when the DAP hourly cron runs.